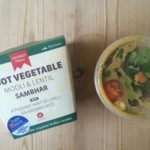 I have been trying some really interesting products recently; it always makes for a brighter day when your lunch includes something new and different. Always welcome in my kitchen is something delicious and easy to make a tasty dinner in a flash. 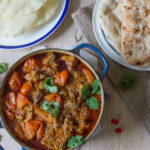 This month I’ve been trying out a new range of curry sauces, puffed chickpeas and chocolate chock full of good stuff; some new store cupboard ideas. I tried out two of the Funky Elephant products; the Karahi Curry Sauce and the Spiced Tikka Marinade Paste. I have to confess that I had to decant the paste into another container as I knocked it off the kitchen worktop by accident and broke the tub! But the packaging on the paste was as lovely as the one for the sauce. The Karahi curry sauce was really easy to cook with; fry some veg, add a bit of chicken, pour in the sauce, simmer and voila. It had a lovely fresh flavour and wasn’t too salty. The paste I have used as a marinade twice; once I mixed it with yoghurt and the other time with oil and both worked well. It’s got a chunkier texture than other pastes, it’s not completely smooth and I like that and is so full of flavour. The other good thing about this paste is that you’ve got six weeks to use it once it’s opened! Funky Elephant sauces are available from independent retailers. Next up is a great alternative to crisps; puffed chickpeas from Hippeas. Similar in shape to a Wotsit but made from chickpeas and using (where possible) organic ingredients. The chickpeas mean they are higher in protein and fibre than crisps and are all less than 100 calories per bag. I tried out five different flavours: cheese & love, far out fajita, in herbs we trust, pepper power and sweet & smokin’. I was really surprised how many little puffs were in a pack considering they are low calorie and I do think they are more filling than crisps. My favourite had to be the sweet & smokin’ flavour. You can buy a case of Hippeas from their website, 24 packs for £19.95 or in some larger retailers. Lastly I’ve been trying out some chocolate from Doisy & Dam. The packaging on these is so pretty and the names always sound so enticing: maple, toasted rice & pink salt; maca, vanilla & cacao nibs; vanilla & cacao nibs, coconut & lucuma, date & Himalayan pink salt. The two milk chocolates were 39% giving them a lovely chocolate flavour but with a good bit of creaminess; of the two milk chocolates the one with dates in was my favourite it gave the bar a great texture. Of the dark chocolates the maple, toasted rice and pink salt was my favourite, it had a great balance of flavours. (They were all tasty though!). Small bars RRP £1.75, large bars £2.50 available from Doisy & Dam’s website. Thanks to Funky Elephant, Hippeas and Doisy & Dam for the samples. All opinions and words expressed are my own. All prices correct as of 30.3.17.
mmm..those chocolate bars…I would love some with vanilla and maca! mmm..those chocolate bars sound awesome. I would love some maca and vanilla. The Karahi Curry Sauce and the Spiced Tikka Marinade Paste sound fantastic, Caroline. And I am also in so much love with chocolate bars. All fun thing to try, very curius about the puffed chickpeas! 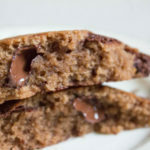 nd well chocolate…ANY TIME! I got Daisy & Dom’s vanilla and cocoa nibs at Christmas and it was delicious!